Back in Brooklyn for the month of Oct. to perform in a play called The Dreary Coast. Written and produced by my old friend Jeff Stark. The play is set on the Gowanus Canal. 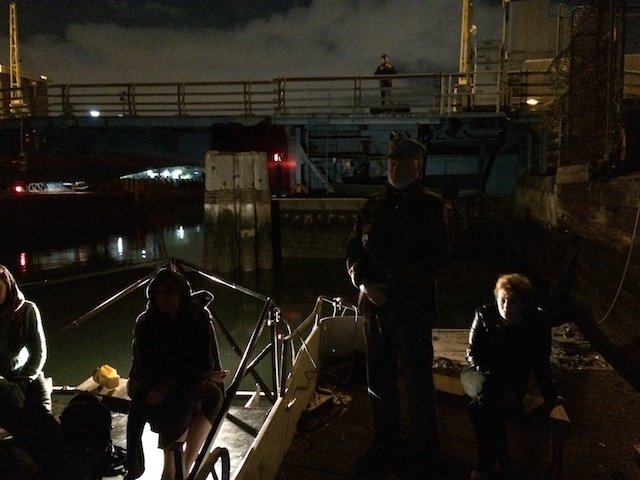 To be clear, the audience and actors will be in boats and on the shores of the Gowanus. Lop off the G-O-W on the name and you pretty much have an onomatopoeia. The challenges of this production are many. I’ve been on a lot of crazy complicated art projects. This is cracky-crazy. The Gowanus canal is a special wild part of Brooklyn that is transforming before our eyes. A super-fund clean up site with a Whole Foods on the embankment… and under construction, a beer garden and federal prison transfer station. NY changes in the blink of an eye for better and worse. The story and setting of the play are epic. You can read about it in the Gothomist. What am I doing? I’ll be driving a boat…and singing with a band behind me in one scene. Guess who? You’ll have to come see. See you at the show. Don’t fall in the water.